At 6:35 pm local time, the Boeing 747, in nearly a ninety-degree bank with its right wing pointing at the ground, ploughed into two high-rise apartment complexes in the Bijlmermeer neighborhood, at the corner of a building where the Groeneveen complex met the Klein-Kruitberg complex. The building exploded into flames and partially collapsed inward, destroying dozens of apartments. The cockpit came to rest east of the flats, between the building and the viaduct of Amsterdam Metro Line 53. During the last moments of the flight, the arrival traffic controllers made several desperate attempts to contact the aircraft. The Schiphol arrival controllers work from a closed building at Schiphol-East, not from the control tower. At 6:35:45 PM, however, the control tower reported to the arrival controllers: "Het is gebeurd" (lit., "It has happened", but often meaning "It is over"). At that moment an enormous cloud of smoke was visible above Amsterdam from the control tower. 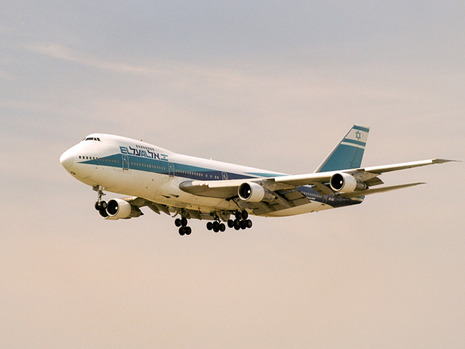 El Al Flight 1862 disappeared from arrival control radar. The arrival controllers reported that the aircraft had last been located 1 mile west of Weesp. Immediately, emergency personnel were sent to Weesp. At the time of the crash, two police officers were in the Bijlmermeer checking on a burglary report. They saw the aircraft plummet and immediately sounded an alarm. The first fire trucks and rescue services arrived within a few minutes of the crash. Nearby hospitals were advised to prepare for hundreds of casualties. The flats were partly inhabited by undocumented illegal immigrants, and the death toll would be difficult to estimate in the hours after the crash. In the days immediately following the disaster, the bodies of the victims and the remains of the plane were recovered from the crash site. The remains of the plane were transported to Schiphol for analysis. The parts were not used by investigators to reconstruct the aircraft. Fifteen hundred (1500) people were considered missing immediately after the crash. The Dutch government originally estimated a death toll of over 200. In the end, the official death toll on the ground stood at 39, considerably lower than expected. The plane carried only the flight crew and one non-revenue passenger, thus the total number of deaths is 43. At the time of the crash many potential victims were not at home, possibly due to the pleasant weather on the evening of the crash. Twenty-six victims were located. Eleven of these had been taken to the hospital. Rumors have persisted that the actual ground victim count must have been higher than 39. At very high temperatures such as those encountered after the crash of a jet loaded with fuel, about 1,100 °C (2,000 °F), bodies can be completely incinerated. Additionally, the apartment complexes where the El Al flight crashed contained many undocumented residents, illegal immigrants to the Netherlands. The Dutch parliamentary inquiry commission concluded during the investigation that the number of located bodies was more or less commensurate with the final number of missing persons, and that therefore there were no reasons to suspect that the actual ground death toll was higher than 39. Final clearance was given to turn right heading 270 to intercept the final approach course. When it became apparent that the aircraft was going to overshoot the localizer, the controller informed the crew accordingly and directed them to turn to heading 290 to try and intercept the final approach path again. A further instruction was given a 310 heading and descent clearance for 1500 feet. These instructions were acknowledged and the crew added that they were experiencing control problems now as well. 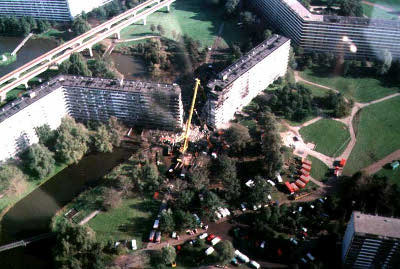 While reducing speed in preparation for the final approach, control was lost and the aircraft crashed into an eleven-floor apartment building the Bijlmermeer suburb of Amsterdam.